I’m baaaack!! Did you miss me? I feel like everyone’s been so busy this time of year that it’s possible no one even noticed I haven’t blogged in two weeks. I’m just so used to being on top of my baking and blogging game every week, that when I slack a bit here I feel so guilty about it. But thankfully desserts aren’t a matter of life and death, and if life is hectic with moving in, building furniture, and getting ready for our puppy (this Sunday, ahhhh! ), it’s okay to take a break for a bit. 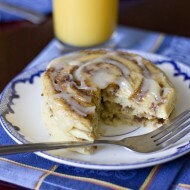 I’m SO excited to be back in the kitchen now that it’s fully unpacked and share a new recipe with you. An easy recipe of course, let’s take things slow here, but a very good one nonetheless. I couldn’t let September go by without at least one apple recipe, that would be blasphemy in the blogosphere! 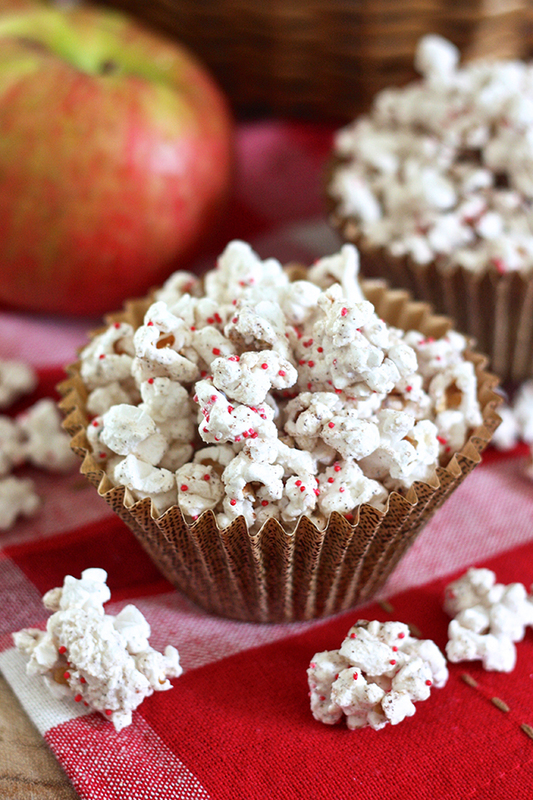 I love, love making flavored popcorn recipes with all sorts of fun mix-ins. 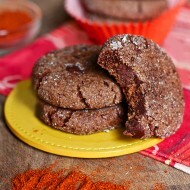 It’s such a crowd pleaser and great for parties too. 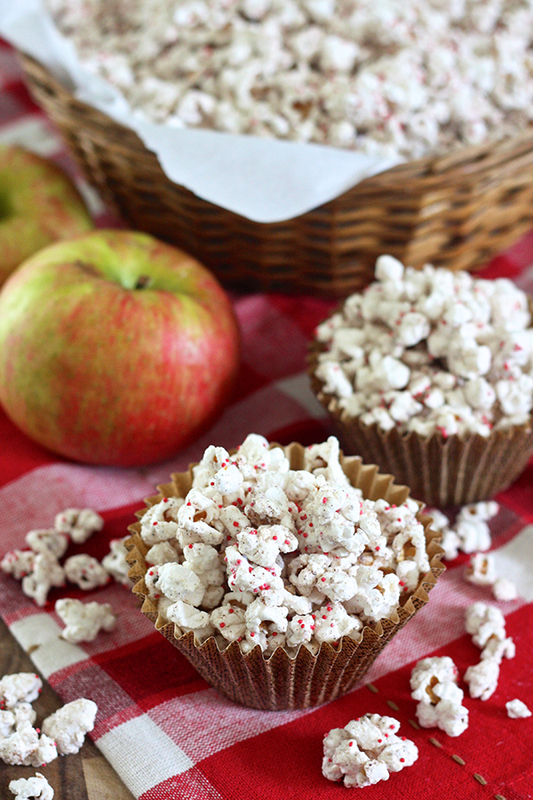 Infusing apple flavor can be difficult with recipes like this, but thankfully I thought of the perfect method to load this popcorn with appley goodness – freeze-dried apples! Just blast them in the blender a few times to turn the crispy apples into a powder that can be mixed into the melted white chocolate. Kind of like the funfetti popcorn I made that calls for cake mix powder to be added to the white chocolate before coating the popcorn. 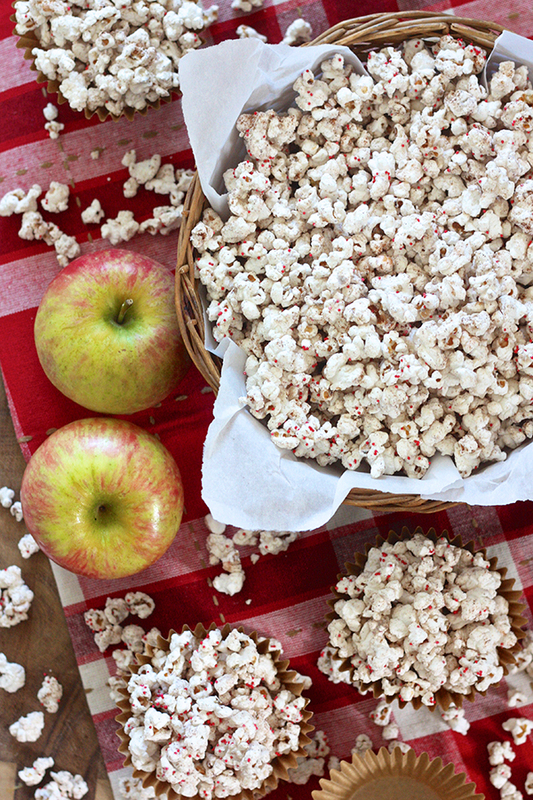 With cinnamon, all spice, and nutmeg mixed in too, you’ve got all the flavors of apple pie in one kernel of popcorn. 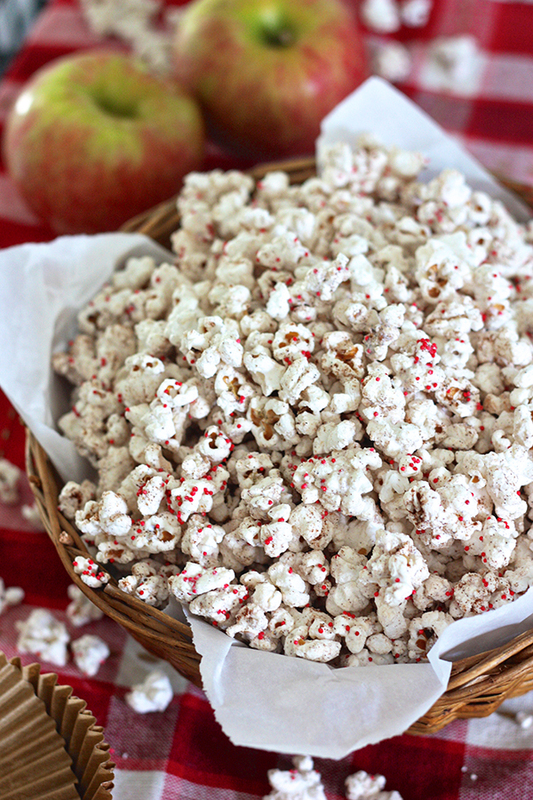 The red nonpareils also add some festive color to give the popcorn even more pop. 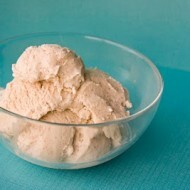 Place freeze-dried apple slices in a blender and pulse until they form a powdery mix with only some small crumbs. Set aside. Cover a large cookie sheet with wax paper and set aside. Place the candy melts in a microwave-safe bowl and microwave in 30 second intervals, stirring well between each interval, until completely smooth. Add the vegetable oil, spices, and powdered apples and stir well. Pour the chocolate mixture over the popcorn and use clean hands or a rubber spatula to spread the chocolate around so that it is evenly distributed on the popcorn. Spread the coated popcorn onto the prepared cookie sheet so that it is almost in a single layer. Sprinkle extra cinnamon and red sprinkles on top and allow candy coating to dry completely (you can also put it in the fridge for 10 minutes to speed up the process). Store popcorn in an airtight container for up to one week at room temperature.